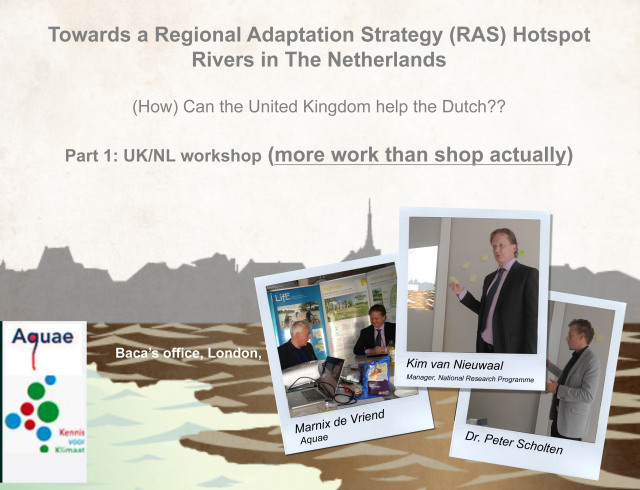 Baca Architects held an anglo dutch workshop to explore how the UK can help the Dutch with flood risk planning and climate adaptation. This is the three workshops in which the Dutch are seeking to learn from other countries (including Germany and Cameroon) to improve their approach managing floods. The attendees included Marnix de Vriend, director Aquae, (NL), Kim van Nieuwaal, manager at the National Research Programme Knowledge for Climate (NL), Rachael Hill, Senior public official strategist on flood issues, Environment Agency (UK), Peter Scholten, PhD Water Governance, Director, director Academic Alternative (NL), Robert Barker, director of Baca Architects (UK) and Richard Coutts, director of Baca Architects (UK). we are pleased to say that both Richard and Robert won their friendly debates – though it should be said they had the home advantage of speaking in English. We look forward to sharing knowledge and working with the Dutch and visa versa.